WordPress Easy Paypal Payment or Donation Accept Plugin is an easy to use WordPress plugin to Accept Paypal payment for a service or a product or Donation in one click. It can be used anywhere on your site (sidebar, posts, pages etc). After receiving numerous requests, I have added multiple currency support and a donate button option to this WordPress plugin. See the change log section below. 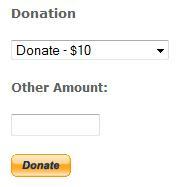 WordPress admins can also configure this plugin with a ‘Donate’ button to receive donations through PayPal. A while back I was looking for a WordPress plugin to use on one of my sites to accept payment for a simple service without the Customers having to log in to my site or become a member and stuff like that. I couldn’t find a simple enough WordPress plugin that does the job so I wrote one myself. One of my friends used it and suggested that I should make this plugin available for others to use. So I tidied up some code and decided to release it. The Plugin can be configured to accept payment for a service or a product in one click. The Plugin can also be configured to accept donation too. See the screenshots for example. 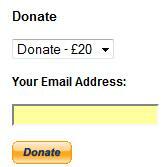 You can also configure it to accept a donation amount entered by the user. This plugin does not give you a shopping cart or e-commerce functionality. Check out the WordPress Simple Paypal Shopping Cart plugin, If you are looking for an e-commerce plugin for your WordPress site. 1. Unzip and Upload the folder ‘WP-accept-paypal-payment’ to the ‘/wp-content/plugins/’ directory. 3. Go to Settings and configure the options eg. your email, Subject text etc. 4. Add the following trigger text/shortcode to a post or page where u want it to appear. see the Usage section for more details. 1. Add the following shortcode to a post or page. 3. Use the ‘WP Paypal Payment’ Widget from the Widgets menu. This plugin comes with a couple of very powerful shortcodes to create a PayPal payment button. The following section has usage examples so you can see how to use these shortcodes. Note: You will need to replace the example values in the shortcode parameter with actual value for your site. You can specify a currency code using the “currency” parameter in the shortcode. This allows you to create multiple different payment widgets to accept payment in different currencies (if you want to). This shortcode can be used anywhere on your site and as many times as you want with different values to accept payment for another product or service. It will open the paypal payment page in a new window when the user clicks the buy now button. You can use the “tax” parameter to specify a tax amount for the payment. Use the parameter reference=”” in the shortcode will hide/disable that field. If you want to use a text based payment button (instead of an image) then use the “button_text” parameter in the shortcode. You can use the following shortcode to create a payment widget that your users can use to send you any amount of money. You can use the following shortcode to create a payment widget for any amount with a specified currency. You can use the following shortcode to create a payment widget for any amount with a custom label for the amount field. Check this tutorial to learn how to add a payment widget to the sidebar. Fixed a small issue using the other amount option with the shortcode. Added an option to specify “tax” parameter in the payment shortcode. Added more parameters in the “wp_paypal_payment_box_for_any_amount” shortcode. New parameters are “reference” and “currency”. Added an option to specify a custom button image for the payment widget. Added a custom shortcode option where all the parameters can be specified in the shortcode. this will allow you to create multiple paypal payment widget in various places of your site. Fixed an issue whereby the decimal numbers were getting stripped from the paypal payment amount. Added a “Return URL from PayPal” field. Made the Reference Text customizable and optional. Removed the link to settings option from the widget panel. Added more payment options (up to six). Fixed up some minor ‘html’ bugs. A customer clicks on the Pay Now/Buy Now button and goes to paypal to pay for the product or service. Now before hitting the “Pay Now” button the customer can specify a shipping address by clicking on “Change Shipping” that is shown below the default shipping address. If you need help wth this plugin (such as additional currency support etc) or if you find an issue with the plugin then leave a comment. Don’t forget to check out the WordPress Simple Paypal Shopping Cart plugin which also allows you to sell products and services site-wide and has shopping cart functionality or the WordPress Donation Plugin which allows you to receive a simple donation. If you are looking for a professionally supported, feature rich and robust way to sell products or services then check out our WP eStore plugin. Excellent plugin! For those of us who need more control over design elements, would it be possible to add additional css selectors in place of breaks so users can style line spacing without having to go into code to delete breaks? First of all, thank you very much for offering us this great plugin. I have a suggestion, that might be useful: it would be fantastic being able to insert the currency symbol somewhere near the price numbers when using the wp_paypal_payment_box. Anyway, it is a great plugin and contribution to the WordPress community. Thank you again. @Lincoln, Don’t have an option to make it a mandatory field yet. @DJ, Yes it is compatible with WP 3.8. All our plugins are kept upto date to work with the latest WordPress version. Plugin perfectly suited my needs…thanks! Is it compatible with WordPress 3.8? If not, will it be updated? @Chore, you can accept mexican peso too. See the shortcode examples above, there is one that shows you how to specify the currency code. Admin and what about accepting MXN currency (Mexican pesos)? @Calvi, SGD (Signapore Dollar) is already supported. You can use the shortcode with that currency to accept payment in singapore dollar. See the shortcode usage example above to learn more. Hi, is there a way to add more currency to it? I need SGD currency payment form. Thanks! Very nice plugin. Can it accept subscriptions or recurring payments? @rizve, You can add as many service boxes as you want. Please read the shortcode usage section and you know how to do it. thanks for nice plugins. I wants to add more service box how I can do that? I saw that there is only 6 Payment Option but i wants to add more. is there any possibility to add more? Please help me. I really appreciate. Great plugin – Quick question – Is there anyway to make the Pay Now button larger? Everything about button is working great on my end, except the pay now button displays VERY small to the point where it is not legible. Please let me know if there is a way to alter the button size. @Kimberley, what shrotcode are you using to create the payment button widget? When I have options in the drop down menu, the custom box doesn’t work – it is just taking a value from the drop down menu and ignoring the custom field. Is it possible with this nice pugin to protect content in order to give access via PayPal Payment? If not: Maybe you like to develope it further and sell a new plugin? Is there a way to use this plug in with just pay pal and no other payment options besides donate? @zsuzsi, This plugin won’t be able to handle the “pay-what-you-can” price model and then deliver the ebook automatically. WP eStore plugin will do the job. My husband uses your premium shopping cart plugin and loves it. i was just looking for a plugin to sell one e-book for a “pay-what-you-can” price. Users would select a price from a drop-down box and then pay (via Paypal) and then the e-book would get emailed to them automatically. Not sure whether your Easy paypal payment or donation accept plugin will do this. Or do I need to use your plugin with a shopping cart in order to have the e-book emailed automatically? I am currently setting up a simple website for a small non-profit organisation, and money is at a premium so this plugin will save me buying and installing a full-blown ecommerce plugin for them at the moment. Down the track when they get established I will be looking at your premium shopping cart and membership plugins, but I need to get them up and running on a shoestring. One thing I would love is another parameter in the shortcode for specifying the button type (Buy Now or Donate) — at the moment it is either/or, and I need to have both types of buttons, one for donations, and one for the half-dozen or so products that they sell. Is this possible, or would it be possible to do? TIA. @Bill, at the moment it doesn’t have that option. Thank you thank you thank you!! Seriously. However, it took me a while to realize that I didn’t have the updated version. I was having the same problem as Patrick and freaking out. All fixed now. Our association thanks you! @Andrew, Can you please post a link to the page where I can see it? Useful plugin, thanks. However, even though the Pay Now button works, I need to use the Donate button, which doesn’t. This means that the graphic of the button does not appear, only a question mark, which means the button graphic is not available. @Ross, You can use the “Referece Text Box” to collect the invoice number. Go to the settings area of this plugin then check the “Show Reference Text Box” field and customize the “Reference Text Box Title” field’s value. Also, add the 4% fee in the price. So you can tell them that the price includes 4% fee. I am looking to use the plugin for clients to pay their invoices, so they need to be able to add the invoice number, value (manually) and I need to add a 4% handling fee. Is it possible to add these features to the plugin? @Patrick, please download a new version of the plugin (v2.9) from this page and you shouldn’t see that issue anymore. I like the plugin but have one question, when I inserted the HTML code into the page, the button will always go to the top of the page. I have multiple items I wish to have buttons for and for some reason, it is not staying in the spot of HTML code in which I have created the button. @David, Yes. Please take a look at the shortcode option where you can specify as many payment options as you want. Is it possible to have more than 6 predefined payment amounts? Simple to use and easy to install, just 5 minutes to go live! in order to install it again ?! In other words, to have 2 of the plugins!! but rather 2 payments for something else, and 2 payments for something else. Thanks for sharing the plugin I installed it on my site and is working perfectly.Looking forward for the next version update. Awesome plugin and very easy to use, thank you. I found it (was looking in the wrong place) thanks to another poster’s really helpful video: thanks Tarek Alaaddin for http://getyourblogready.com/add-paypal-to-wordpress-blog/ Very helpful to see the demo! All sorted now I hope. This plugin looks like just what I was looking for! Can you clarify one thing please. I uploaded it to my plugs but when you say “Go to Settings and configure the options eg. your email, Subject text etc”, I don’t get the Settings option (just Deativate or Edit the code – and I don’t really know my way around that!). Guys if you looking for a quick paypal plugin to get the job done, then this is one..
as a thank you, I created a quick video tutorial that shows you how to set it up and configure it in detail.. Thanks again for all your hard work…Developers like you is what makes wordpress GREAT!!! Excellent plugin, this is what i was looking for. I have a site that deals with “deal” like metro deal and other site that can use the donation option as well. You are good admin, you have what i wanted. great one. totally amazing.